Custom made to order, FYP Matches are created by imprinting your design onto your paper of choice and then securing it with a durable adhesive around the body of each matchbox, leaving the striker pad accessible. This time-tested method allows for the vast array of paper types and colors we offer. Hand assembled, these are not the mass-produced, printed matches you would pick up in a bar or restaurant. A manufacturer's mark may appear on the bottom edge of Strike Matches. Personalize your Matches with text and illustrations from our extensive, designer-curated collection. With over 100 paper colors, 150 fonts, 50 foil colors and 1,300 clipart images, you can create the perfect party accessories for your event. You also have the option to Upload Your Own Art for a truly unique product. Please note that only certain designs will fit on your matches, depending on the size of the box. 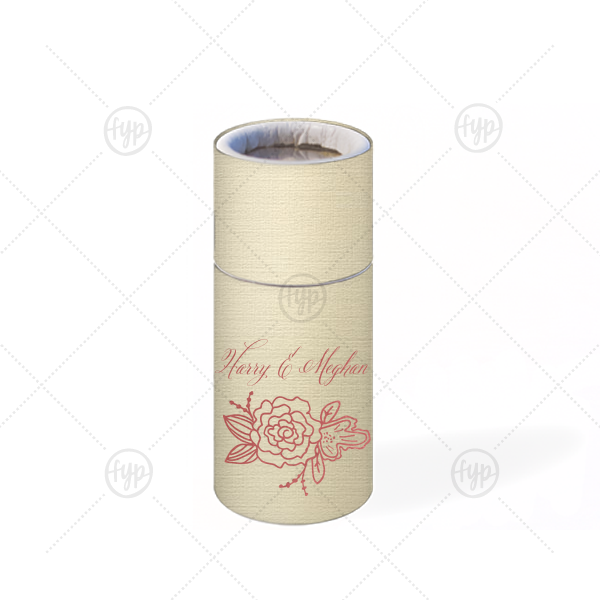 ForYourParty's elegant Linen Ivory Barrel Matchbox with Shiny Rose Quartz Foil has a Peony Accent graphic and is good for use in Floral and Elegant Wedding and Parties and will look fabulous with your unique touch. Your guests will agree!